CITY of Plymouth pole vaulter Noah Jones reached new heights at the Cardiff Met Christmas Classic Grand Prix at the weekend. 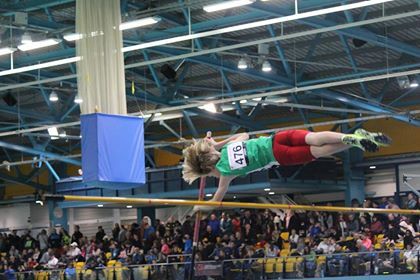 Jones leaped a new personal best of 3.10m to finish as second under-15 behind Wales’ William Trott. That was 10cm higher than Jones had previously leaped in a competition and means he is likely to finish the year ranked 22nd in the country. Tavistock throwers Charlie and Lee Shipton also impressed at the event in Cardiff, with both setting new club records. Charlie threw 8.78m as a senior, while Lee, making his debut at under-20 level, managed 8.38m. Meanwhile, Plymouth Harriers’ Jane Allison set a new age group course record at December’s Tavy 5k. Allison clocked 20.43 minutes to set a new mark in the women’s over-45 category, despite poor weather conditions. She was second female on the day, finishing behind Tavistock AC’s Sam Lake, who won in a quick time of 19.12 minutes. Fellow Tavistock athlete Nikki Kelly was third women in 21.46. The overall winner was Tavistock AC’s Burt Thomas, who came home in 17.05 minutes, with Plymouth Harriers’ Alex Peyton-Jones second in 17.32 and Derrick Warren third in 17.59. Allison was not the only athlete to set a new record. Barrie James set a new best for a male over 85.